We discuss charged and static solutions in a shift-symmetric scalar-tensor gravity model including a negative cosmological constant. The solutions are only approximately Anti-de Sitter (AdS) asymptotically. While spherically symmetric black holes with scalar-tensor hair do exist in our model, the uncharged spherically symmetric scalar-tensor solitons constructed recently cannot be generalised to include charge. We point out that this is due to the divergence of the electric monopole at the origin of the coordinate system, while higher order multipoles are well-behaved. We also demonstrate that black holes with scalar hair exist only for horizon value larger than that of the corresponding extremal Reissner-Nordström-AdS (RNAdS) solution, i.e. that we cannot construct solutions with arbitrarily small horizon radius. 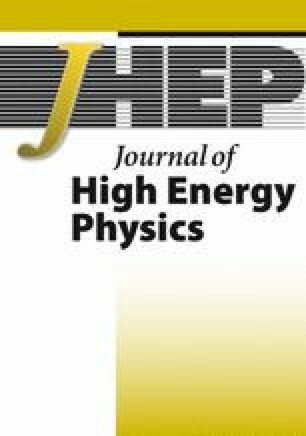 We demonstrate that for fixed Q a horizon radius exists at which the specific heat CQ diverges — signalling a transition from thermodynamically unstable to stable black holes. In contrast to the RNAdS case, however, we have only been able to construct a stable phase of large horizon black holes, while a stable phase of small horizon black holes does not (seem to) exist. K. Schwarzschild, On the gravitational field of a mass point according to Einstein’s theory, Sitzungsber. Preuss. Akad. Wiss. Berlin 1916 (1916) 189 [physics/9905030] [INSPIRE]. P.T. Chrusciel, ‘No hair’ theorems: Folklore, conjectures, results, Contemp. Math. 170 (1994) 23 [gr-qc/9402032] [INSPIRE]. J.D. Bekenstein, Black holes: Classical properties, thermodynamics and heuristic quantization, in proceedings of the 9th Brazilian School of Cosmology and Gravitation (BSCG 1998), Rio de Janeiro, Brazil, 27 July–7 August 1998, gr-qc/9808028 [INSPIRE]. P. Breitenlohner, P. Forgacs and D. Maison, Gravitating monopole solutions. 2, Nucl. Phys. B 442 (1995) 126 [gr-qc/9412039] [INSPIRE]. P.C. Aichelburg and P. Bizon, Magnetically charged black holes and their stability, Phys. Rev. D 48 (1993) 607 [gr-qc/9212009] [INSPIRE]. LIGO Scientific and Virgo collaborations, Observation of Gravitational Waves from a Binary Black Hole Merger, Phys. Rev. Lett. 116 (2016) 061102 [arXiv:1602.03837] [INSPIRE]. LIGO Scientific and Virgo collaborations, GW151226: Observation of Gravitational Waves from a 22-Solar-Mass Binary Black Hole Coalescence, Phys. Rev. Lett. 116 (2016) 241103 [arXiv:1606.04855] [INSPIRE]. LIGO Scientific and VIRGO collaborations, GW170104: Observation of a 50-Solar-Mass Binary Black Hole Coalescence at Redshift 0.2, Phys. Rev. Lett. 118 (2017) 221101 [Erratum ibid. 121 (2018) 129901] [arXiv:1706.01812] [INSPIRE]. LIGO Scientific and Virgo collaborations, GW170814: A Three-Detector Observation of Gravitational Waves from a Binary Black Hole Coalescence, Phys. Rev. Lett. 119 (2017) 141101 [arXiv:1709.09660] [INSPIRE]. LIGO Scientific and Virgo collaborations, GW170608: Observation of a 19-Solar-mass Binary Black Hole Coalescence, Astrophys. J. 851 (2017) L35 [arXiv:1711.05578] [INSPIRE]. LIGO Scientific, Virgo, Fermi-GBM and INTEGRAL collaborations, Gravitational Waves and Gamma-rays from a Binary Neutron Star Merger: GW170817 and GRB 170817A, Astrophys. J. 848 (2017) L13 [arXiv:1710.05834] [INSPIRE]. LIGO Scientific and Virgo collaborations, GW170817: Observation of Gravitational Waves from a Binary Neutron Star Inspiral, Phys. Rev. Lett. 119 (2017) 161101 [arXiv:1710.05832] [INSPIRE]. J.M. Maldacena, The Large N limit of superconformal field theories and supergravity, Int. J. Theor. Phys. 38 (1999) 1113 [Adv. Theor. Math. Phys. 2 (1998) 231] [hep-th/9711200] [INSPIRE]. E. D’Hoker and D.Z. Freedman, Supersymmetric gauge theories and the AdS/CFT correspondence, in proceedings of the Theoretical Advanced Study Institute in Elementary Particle Physics (TASI 2001): Strings, Branes and EXTRA Dimensions, Boulder, Colorado, U.S.A., 3–29 June 2001, pp. 3–158 [hep-th/0201253] [INSPIRE]. M.K. Benna and I.R. Klebanov, Course 13. Gauge-String Dualities and Some Applications, Les Houches 87 (2008) 611 [arXiv:0803.1315] [INSPIRE]. S.A. Hartnoll, Horizons, holography and condensed matter, in Black holes in higher dimensions, G.T. Horowitz ed., Cambridge University Press (2012), pp. 387–419 [arXiv:1106.4324] [INSPIRE]. Y. Brihaye and L. Ducobu, Hairy black holes: from shift symmetry to spontaneous scalarization, arXiv:1812.07438 [INSPIRE].